North Augusta, SC……..Mr. Kenneth F. “Bull” Moore, 89, husband of Patricia Moore, entered into rest on Thursday, March 21, 2019 at his residence. His funeral service will be held at 11:00 AM on Monday, March 25, 2019 in the Rowland-Ford Funeral Home Chapel. Interment will follow in Sunset Memory Gardens with Veteran’s Honors and Masonic Rites accorded at the committal. A native of Charleston, SC, Bull was a man who enjoyed many things, nothing brought him more joy than entertaining people and making them laugh. He did this in many ways, jokes, stories and his favorite, being a clown. 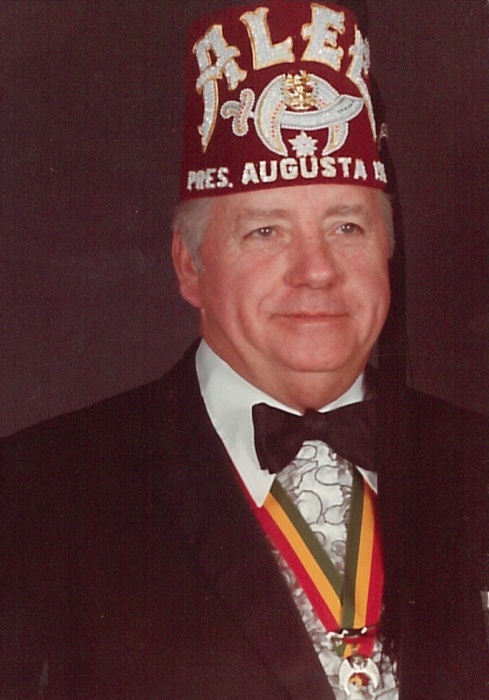 Bull would spend weeks, sometimes months, preparing magic tricks, jokes and stories for his interaction with people as he served with the Shriner’s Clown Unit. He was a member of the Alee Temple where, in addition to holding nearly every position, he was also a past president. Bull was a 32nd degree Master Mason, a member of the Scottish Rite and York Rite appendant bodies and a member of the Belvedere Masonic Lodge #388 where he held many positions including Past Master. He served the IBEW for 65 years as an electrician and worked in numerous sites all around the country. An avid outdoorsman and fisherman, he once caught a record breaking 39 pound 8 ounce catfish out of Lake Marion. At a young age, Bull joined the Merchant Marine. It was during this time that he was aboard the first boat to pass through the Panama Canal. Following his time in the Merchant Marine, Bull served his country in the US Army twice. He enlisted as a teenager prior to attaining the legal age for enlistment. He was found out by the Army and was forced to resign until he reached the appropriate age. When his birthday rolled around, Bull joined up again. Bull was a man who loved and a man who was loved, he will be remembered most fondly by his family for his love of life and laughter. Additional survivors include his children, Clifford (Margie), Michael, Gloria, Glenn and Melony; ten grandchildren, twenty great grandchildren; one great great grandchild and special family members, Tammye and Dru Trapp; Amber and Phillip Willis and their daughter Morgan Grace. He was preceded in death by his children, Malinda, Marvin, Steadman and Donna as well as his siblings, Rich, John and Arlene. Honorary pallbearers will be members of the IBEW, Belvedere Masonic Lodge #388 and The Augusta Shrine Club. The family will receive friends at the funeral home on Sunday, March 24, 2019 from 3:00 PM until 5:00 PM. In lieu of flowers the family requests that memorials be made to the Shriner’s Hospital for Children of Greenville, 950 W Faris Rd, Greenville, SC 29605. Visit the online register at www.rowlandfordfuneralhome.com to read his full obituary and leave condolences for the family.